One of the difficulties with investing in early stage cleantech startups is that oftentimes the investors need to take a very long term view of the companies they back — many startups won’t mature into commercial firms for years. This is particularly difficult when technologies are risky — even speculative — and the investment is made at an early stage. Next-gen biofuel company KiOR is a prime example of this long term, high risk phenomenon. In 2011, then four-year-old KiOR was one of the few stand-out examples of what could be possible for a cleantech exit. While the IPO market for most cleantech companies was truly “weak” in 2011, as the researchers at the Cleantech Group put it (there were about half the number of cleantech IPOs in 2011 as 2010) KiOR held an IPO in the summer of 2011, which was a blockbuster win for the company’s investors back then on paper. Valley venture firm Khosla Ventures, San Francisco hedge fund Artis Capital Management, and Aberta-based fund Alberta Investment Management were some of the largest shareholders at the time of KiOR’s IPO. Khosla Ventures itself held around 72 percent of the voting power of KiOR at the time of the IPO. Khosla Ventures founder and Partner Vinod Khosla told the Economic Times of India in November 2011 — 5 months after the IPO — that KiOR and its IPO represented a 50 times return on the firm’s investment. A few months earlier, in September 2011, Khosla told a conference audience that his firm’s biofuel portfolio contains about $1 billion in “liquid profits” – those are tradeable, public shares – thanks to several of the biofuel companies that his firm backed that had gone public in 2010 and 2011. Having successes like these to point to can make it that much easier for a venture firm to raise future funds. Khosla Ventures announced that it had raised another $1 billion fund in October 2011, and also announced that it wasn’t changing its strategy away from investing in early stage cleantech startups. I’ve also heard that bankers for KiOR’s IPO have used KiOR as an example of the success of the biofuel IPO market. And that’s all well and good. But the reality is that the liquidity of KiOR’s IPO could be locked up for a long time, potentially many years down the road, until — and if — the company scales up and meets expectations. Next-gen biofuel companies can be very risky in general (look what happened to Range Fuels — more on that firm later); KiOR is currently in a pre-commercial stage (it makes no revenues or profits yet); the company will require more funding to scale up its bio-crude production (which could involve issuing more shares and diluting investors); and in the short term, the company’s stock could tank if the investors sell a substantial amount of their shares. How does the company’s early prime investors eventually get the money out? They wait and hope. KiOR has developed a technology that allows it to convert biomass into a bio substitute for crude oil. The Houston,Texas-based company emerged in late 2007 as a joint venture between Khosla Ventures and Netherlands-based biofuel startup BIOeCON. Khosla Ventures provided the early rounds of funding and BIOeCON provided the intellectual property for its “biomass catalytic cracking process,” a thermochemical process that’s been used in the oil industry for decades and which turns out can also produce biocrude from grass, wood and plant waste. In the Spring of 2010, at Khosla Venture’s Limited Partners meeting, which the press was allowed to attend, KiOR’s President Fred Cannon described KiOR’s technology as being able to crunch into seconds the millions of years that it takes for nature to turn biomass into fossil fuels. Cannon said the company’s catalyst — a fine white powder that he showed to me in a tiny see-through vial after his talk — can turn any bio feedstock into a liquid biocrude that has a 92 percent lower carbon emissions footprint than fossil-fuel based crudes and which is supposed to be able to be dropped into the current oil infrastructure. The potential market is no less than to displace oil for transportation. Khosla Ventures partner Vinod Khosla was confident enough in the company in the spring of 2010 that he said at the LP event that KiOR’s competitors aren’t other biofuel companies, but rather, the heads of major oil exporting nations like Venezuela President Hugo Chavez and Iranian President Mahmoud Ahmadinejad. KiOR even impressed former Secretary of State Condoleezza Rice to the extent that she joined KiOR’s board in the Summer of 2011. When KiOR went public at $15 per share in June 2011, not only was the company able to raise $137.4 million from the IPO to work on scaling up its biofuel technology, but Khosla Ventures ended up maintaining 74.8 percent (46.26 million shares) of KiOR’s Class B common stock and 23.9 percent (9.10 million) of KiOR’s class A common stock for a total of 55.36 million shares — making Khosla by far the largest shareholder. At the $15 per share IPO price, the share portion was worth $830 million. When KiOR’s shares later rose to $23.85 per share, that portion was worth $1.32 billion. Artis, at the time of the IPO, owned 30.1 percent (11.45 million shares) of the Class A common stock. Over the three months following the IPO, Artis Capital Management also steadily bought up KiOR shares. And as of September 30, when Artis reported its holdings, it owned more than 14 million shares of KiOR, reported Down Jones Venture Wire last Thursday. (On a side note, I’ll mention that Pierre Lamond joined Khosla Ventures in 2009 from Sequoia Capital and is the father of David Lamond, an investor at Artis Capital. In addition Dow Jones Venture Wire reported last Thursday that David Lamond has now left Artis Capital). Other large shareholders at the time of the IPO included Alberta Investment Management, a fund that manages billions on behalf of the province of Alberta, Canada, and which is also a limited partner in Khosla Ventures; the original founders and execs with BIOeCON also held substantial shares (It’s a bit controversial in the venture capital community to have a limited partner invest alongside the fund). KiOR’s stock price and value recently dropped over the past couple of weeks to $9.03 per share at the close of Wednesday’s market. That put those 55.36 million Khosla Ventures shares at a valuation of $510.42 million — about half of what they were at the height of the stock price in September. But still, pretty high, considering Khosla Ventures invested around $14 million into KiOR in its first rounds and then participated in KiOR’s two later rounds that totaled $95 million, and $55 million respectively. The slight stock drop could be due to investors selling a bit after the first 180-day lock-up period expired in late December. KiOR Director (Amyris CEO) John Melo and Director Ralph Alexander have both sold shares in recent weeks. 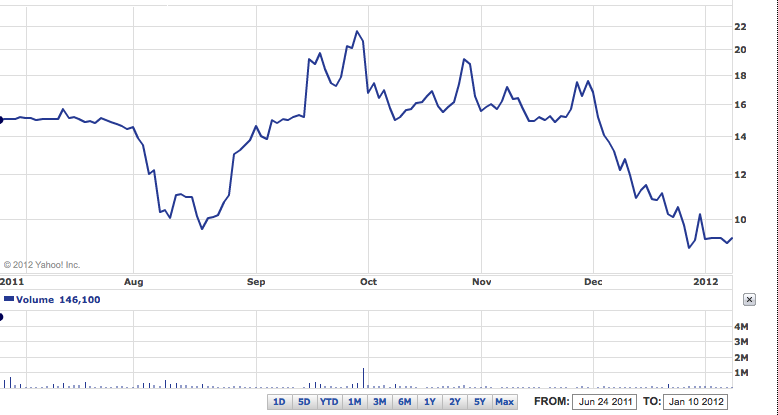 However, Artis and Khosla Ventures don’t seem to be selling. Artis spokesperson told Dow Jones Venture Wire last week that Artis hadn’t sold any of its KiOR shares. In addition 46.26 million of Khosla Venture’s shares (out of the Khosla Ventures II fund) are subject to a lock-up period of 360 days, not the standard 180 days. Despite the recent dip in stock price, KiOR has actually maintained its stock fairly well over the last 6 months — it’s fared better than other pre-commercial, newly public, next-gen biofuel companies. A couple reasons for this seem to be because 1) the float was so small 2) the company’s shares were owned by so few, and 3) hedge fund Artis Capital Management routinely bought up small amounts of shares on a daily and weekly basis in the three months post-IPO. At the time of the IPO, Khosla Ventures controlled so much of KiOR that the company was considered a “controlled company” (by Nasdaq standards) and that’s likely why bankers had Khosla Ventures agree not to sell a big portion of the shares for at least 360 days. If such a large amount of the shares were sold early on, the stock would likely crash. There are a lot of reasons for floating only a small amount of shares in an IPO. The small float question has recently become a hot topic in the tech industry because Groupon only floated 4.7 percent of its stock, which Business Week called “the lowest Internet float in [a] decade.” Many in Groupon’s case think it helped prop up a higher valuation for the company. It could have had the same effect for KiOR. And at the end of the day when the float is so small, it’s hard to know the value of the company, and it’s difficult to have a true market. While other early stage, next-gen biofuel companies’ stocks have seen a steady decline over the past six months, KiOR (until very recently) managed to mostly maintain (and grow) its share price. When I wrote this article in November, the share prices of Gevo (s GEVO), Amyris (s AMRS) and Solazyme (s SLZM) — all pre-large-scale production next-gen biofuel firms — had fallen considerably, while KiOR maintained its IPO price of around $15 per share until late December. KiOR hadn’t reached any particular milestones that would explain why it was moving against the grain. Instead, the company had a couple less-than-positive blips, such as the recent resignations of both its President Joseph Cappello on October 6, 2011, and its Chief Operating Officer William Coates on September 9, 2011. The catch-22 for Khosla Ventures, Artis Capital and Alberta Investment Management is that if they cash out of the company in any meaningful way early on, it could tank the stock. Khosla Ventures could have distributed its shares to its limited partners already, which means that they now belong to Khosla Ventures limited partners — some of Khosla Venture’s LPs reportedly include CalPERs, Bill Gates, and Alberta Investment Management. I’ve reached out to both Khosla Ventures and KiOR on this, but haven’t heard back. Likely Khosla Ventures and Artis Capital are in it for the long haul and will sit and wait for the company to potentially prove itself out over the coming years — or it won’t. KiOR started building the initial stage of its commercial production facility in Columbus, Mississippi in the first quarter of 2011 and plans to finish the facility by the first half of 2012. According to KiOR’s latest quarterly statement, that first project will require another $114 million. KiOR plans to start building its larger standard commercial production facilities in the second half of 2012, with the first one in Newton, Mississippi. This size of facility is expected to cost around $350 million. Goldman Sachs analyst Mark Wienkes writes that: “The key challenge remains the capital intensity of the scale-up, with KiOR needing about $450 million of additional equity in 2012 to 2013 to support the contemplated plant roll-out.” Wienkes writes that in 2012 he is looking for evidence of the scale-up such as KiOR raising debt financing for the Newton, Mississippi plant, completion of the Columbus plant in the second quarter of 2012, the start of biocrude production at Columbus in the third quarter of 2012, and a follow-on equity round in the second quarter of 2012. If KiOR is able to make it through this scale-up period — which industry-watchers often call “the valley of death” phase — the company could one day turn into a massive oil-replacing giant, with its shares making Khosla Ventures, Artis and Alberta hundreds of millions, if not billions. Imagine owning a big chunk of the IP and original shares of Exxon. But then there’s the reality of the next-gen biofuel market out there, too. There has yet to be a single next-generation biofuel company that has been able to produce a high volume of low cost biofuel that can compete with the oil industry. And there have been a lot of failures. Last month the Wall Street Journal wrote how the Environmental Protection Agency has now projected that just a very tiny fraction — less than one-tenth of 1 percent — of the biofuels that are required by a congressional target to be used in the U.S. in 2012 will come from advanced biofuels. That’s in contrast to a congressional target that advanced biofuels are supposed to account for more than 3 percent of the total in 2012. One of the more high profile biofuel companies that failed to meet expectations has been Range Fuels, which was a company backed early on by Khosla Ventures. Range Fuels raised hundreds of millions of dollars including a $76 million grant from the Department of Energy and an $80 million loan guarantee from the U.S. Department of Agriculture. Despite a lot of fanfare, last year the company shut its plant down, laid off its staff, and recently sold its assets to another Khosla Ventures backed biofuel company called LanzaTech. Another company called Cello Energy, which was eventually hit with fraud allegations and went bankrupt in 2010, was originally thought to be able to produce 70 million of the EPA’s requirements for advanced biofuels. It produced none. Khosla Ventures also at one point had economic interests involved with Cello Energy. For both Cello Energy and Range Fuels the problem was the technology just didn’t work as expected. Will KiOR’s pass muster when it hits commercial scale, and deliver its investors the long term value that they are hoping for? As the cliche goes, we’ll have to wait and see. Many analysts don’t watch this stock, as it’s considered too small, so don’t expect to see much attention on KiOR until it scales up. But the IPO and post-IPO processes are an indicator of how at least a couple of investors are trying to position themselves to try to make big money off of biofuels and cleantech investing, but to do so they’re making a risky bet, and they made it early on. Great article. This pretty much gave me a solid insight into the workings of a company in the clean energy sectors, and risks and rewards of investing in them. As a newbie I truly appreciate the article! Are Venture Capitalists prepared to use different time horizons if the investment is cleantech compared to a similar investment (in terms of potential return) which is not cleantech? I get nervous whenever Khosla is involved. He does not understand the chemistry involved in the preoduction of biofuels and also do not know the history of prior scientific endeavour (syngas to ethanol a.k.a. Range Fuels is an example). He is a very good marketer but he is mostly sizzle and no steak. @nick. This story on KiOR was extremely conservative in terms of how well the company will do or not do. I’m not really addressing if the tech works or not, I’m just pointing out the liquidity aspect, the thinly traded stock that hasn’t really moved all that much and the ways investors are trying to find to make money. @don. Thanks for your comment and for stopping by the site, but I totally disagree with you. The piece was well researched, I read hundreds of documents on this, did dozens of interviews, and have been following and watching KiOR since the day they emerged in 2007. Just about as moronic a story as I have seen. The writer must nto have much to do or understand very much about how this world works. Stupid comments like “has nto produced any fuel” show ignorance of basic ideas like how long it takes to build commercial plants of any sort. Not sure what the perils are given anybody who invested knew exactly what the next years or two looked like. I love statements like “stock could go down”. Which stock cannot go down? Maybe Gigaom needs to get writers that understand the basics of what they report on. You don’t make sense. You think investors know exactly what the next year or two will look like? Let me set you straight: investors actually can’t predict the future. Biofuel companies have largely over-promised and under-delivered. One of the reasons is that companies and their investors tend to underestimate the amount of time/capital it takes to build commercial plants. As the story illustrates, investors are still waiting for KiOR to enter mass production, and maybe then they will make the kind of returns they want. I’ve seen a lot of KiOR bashing on the fora lately (not you but in general) but isn’t it just a bit unfair? They went public, said they would have their plant ready in 2012 and they seem on course. They said that they would not make any money until 2013 which they don’t/won’t, and a lot of investors and analyst have already started to get impatient with this company.. it seem to me what this article is trying to convey, is that this is a long term investment/gamble that people should be very aware of this and adapt their expectations accordingly.